In a large bowl, whisk the parsley with the cilantro, tarragon, capers, cornichons, garlic, mustards and olive oil. 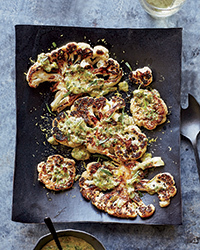 Cut the cauliflower from top to bottom into four 1/2-inch-thick steaks. Generously season them with salt and pepper. In a very large skillet, heat the canola oil until very hot. Add the cauliflower in a single layer and cook over high heat until browned, 2 to 3 minutes. Carefully turn the steaks, add the wine and cook until it is evaporated and the cauliflower is easily pierced with a knife, 3 to 5 minutes. Transfer the cauliflower to a platter and sprinkle with the lemon zest. Stir the lemon juice and vinegar into the salsa verde and season with salt and pepper. Spoon the sauce on the cauliflower and serve. The salsa verde can be prepared through Step 1 and refrigerated overnight. Bring to room temperature before continuing. Review Body: I have been on a cauliflower binge the last couple of years and have cooked everything from Ottolenghi to now Alex. This was a little different and I really loved the "steaks." The salsa verde puts it over the top. Excellent vegetable. Review Body: Oh. my. god. This dressing is ridiculously delicious. I'm just putting it on everything. Lol Made it to go on my husband's Ahi steaks, but ended up putting on all my grilled veggies. So many flavors hit your taste buds. I didn't have any tarragon so I used a stem of fresh oregano and some basil leaedves. Note: in my initial review In mentioned that I omitted the anchovies. But as someone pointed out, there were none in the recipe, so I have adjusted my review.